This still image comes from a video of a moose chasing skiers and snowboarders Saturday at Breckenridge Ski Resort. The woman who captured the video is hoping others will see it and understand they need to keep their distance from the large animals. 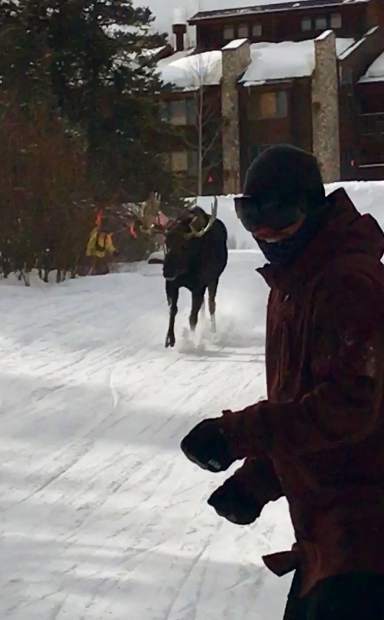 Hoping to warn others about the dangers of moose, a Summit County woman posted on Instagram this weekend a video she captured of one charging skiers and snowboarders Saturday at Breckenridge Ski Resort. That’s when Drogsvold hit record on her phone, took her attention away from it and started digging for speed to get away from the moose as fast as she could while yelling at people in front of her to move and move fast. With her phone still recording, Drogsvold captured only a few seconds of the moose chasing skiers and snowboarders before she dove off the trail and hid behind a nearby tree. She said that no one appeared to suffer any injuries when the moose charged the crowd, but she knows that some of those people in the pack did not react to seeing a moose the right way. “We’re familiar with the dangers of moose, and I feel like, as a local, it’s our responsibility to try to educate people about moose and keep them safe if we can,” she said, explaining that was her reason for editing the short video clips she got, posting them on social media and then agreeing to talk to the newspaper. After posting the video, a handful of people have said they too have been chased by a moose in the same place at Breckenridge Ski Resort, she added. The video is markedly similar to another one shot in 2017 of a moose sprinting down a run at Breckenridge Ski Resort. Prodded by Breckenridge Town Council two weeks ago after a separate reported moose encounter at the resort, the resort’s chief operating officer talked about how its staff try to prevent guests from approaching the highly territorial herbivores, who are generally peaceful but can turn aggressive when they feel threatened. Colorado Parks and Wildlife stands as the only agency in the state with jurisdiction over moose and other wildlife, according to agency spokesman Mike Porras. He added that wildlife officers are the only law enforcement personnel who can make decisions about when to tranquilize and move a moose, and when it is not necessary. Local police departments and other authorities may lend a hand, he said, adding that wildlife officers work with local officials and ski resorts to provide guidance when its officers cannot quickly respond.